Andrew Cashner: 6 IP 4 H 1 ER 0 BB 2 K with an ERA of 4.54. Solid first start for Cashner but only two strikeouts speaks to his limitations. Again if you have an ERA north of 4.50 with Petco Park as your home base, then you barely have SP 5 value. Miguel Cabrera: 3/4 with 2 home runs (23 for season) while hitting .303. Yes we all miss the .330 batting averages but Cabrera still totes a massive stick that is capable of big damage. What is interesting now is that Cabrera has an "old news" feeling surrounding him which means his price is cheaper then ever. Justin Upton: 2/4 with his 12th HR while hitting .239. Upton is in the midst of his best hitting stretch of the season which is not saying much. Yeah it has been a joke of a season. Dallas Keuchel: 7 ER in 5 IP with an ERA of 4.86. Six earned in the first inning pretty much puts a topper on my best BUST pick of the season. Carlos Beltran: 2/4 with his 22nd HR while hitting .304. Beltran could be in his final days with the Yankees as the team has cratered. It has been a terrific comeback campaign for Beltran who is proving his power remains quite potent despite pushing up toward 40. Brad Miller: 1/4 with his 17th HR while hitting .253. Second home run in as many games for Miller. The average is up above .250 which makes the swell infield power that much more valuable. Blake Snell: 5.1 IP 5 H 2 ER 3 BB 9 K with an ERA of 3.08. Snell has good strikeout stuff and seems like the next Tampa Bay pitching gem to come out of the system. Track record in terms of organizations like the Rays developing pitchers or the Cardinals on both sides always stand out. Troy Tulowitzki: 1/2 with his 18th HR while hitting .243. Tulo suffered a chip fracture in his thumb which likely will land him on the DL. Typical Tulo as he seems to love the disabled list. And now his offense is a clear shell of its former All-Star self to make matters more nasty. Adam Jones: 1/6 with his 20th HR while hitting .267. Jones is still hitting leadoff which is nice and like I said the other day, he is not far from his career norms despite the rhetoric he is having a bad season. Chris Carter: 1/2 with his 24th HR while hitting .217. Like with Carlos Beltran in New York, this could be one of the last games in Milwaukee for Carter. Gregory Polanco: 1/3 with his 15th HR while hitting. 287. Seems like the same guys are showing up in the wrapeup on a daily basis, Polanco included. Last season Starling Marte had his full breakout with the Pittsburgh Pirates and this season it is Polanco. Boy the Pirates know how to draft outfielder. Austin Meadows we can't wait to see you. Neil Walker: 3/4 with his 17th HR while hitting .259. By now most Walker owners are former owners as he has been simply horrific since the start of July. This hopefully is a sign of a turnaround but Walker is right back in his usual spot as a fringe/waiver guy. Sonny Gray: 3.1 IP 8 H 7 ER 2 BB 3 K with an ERA of 5.84. Just when you think Gray can't get any worse. Wow he has been putrid and hoenstly Gray already has it locked up in terms of being the absolute biggest pitching bust in relation to draft price in the game this season. Corey Kluber: 7 IP 5 H 0 ER 2 BB 7 K with an ERA of 3.27. Kluber is dominating during the second half again. We have heard that one before. Huston Street: 5 ER in .2 IP with an ERA of 6.45. My goodness. Street has been an abomination and he won't get traded now. He looks completely done and all those years of injuries look like they have stolen his stuff. Joe Smith should slide into the ninth inning now unless he gets moved himself. Tyler Skaggs: 5.1 IP 4 H 0 ER 2 BB 8 K with an ERA of 0.00. Two dominant starts now for Skaggs in his first two outings since returning from Tommy John surgery. By now if you havem't picked him up, it is too late. Skaggs is a bit out of sight/out of mind considering how long he was out but his stuff looks like it survived the surgery without any erosion. Homer Bailey: 5.2 IP 4 H 2 ER 3 BB 6 K with an ERA of 3.18. There may not be a pitcher who has burned pretty much all of us at one time or another. He is healthy now though and still misses bats so you can pick him up for the 1,000th time if you wish. The Baltimore Orioles made a move to shore up the back end of their rotation late Sunday when they acquired veteran starter Wade Miley from the Seattle Mariners. Miley just has to pass a physical for the deal to go through which he is expected to do. Analysis: Miley has gotten hit hard this season while still calling spacious Safeco Field home so there is no need to make any move here. In fact this could get ugly as Miley has been very hittable and now goes into the very rough AL East and in a bandbox ballpark in Baltimore. Tomorrow is the MLB trading deadline at 4:00 ET and we will have EVERYONE on hand working the phones and typing away all the latest rumors and deals as they happen. Be sure to FOLLOW us on Twitter @RotoBoss using the link below to be sure to be sent all the latest as it takes place. The Texas Rangers are taking advantage of Jonathan Lucroy pulling out of the agreed upon trade with the Cleveland Indians to begin advancing talks with the catcher on their hand. The Rangers have been connected to both Lucroy and San Diego's Derek Norris over the last few weeks but now have ramped up discussions with the Milwaukee Brewers regarding the former. Analysis: On and on it goes with Lucroy. At this point we all want this to be over already with the guy. The Mets supposedly remain in the mix but now it looks like it is up to the Rangers to get it done. Kansas City Royals closer Wade Davis was placed on the 15-day DL Sunday with a flexor strain in his elbow and further tests will now be conducted to determine if there is UCL damage. Kelvin Herrera will now close in Davis' place. Analysis: Ugh. Davis has been a classic Tommy John guy as a young pitcher who throws very hard. Stay tuned on that front but it is not looking great. Meanwhile Davis is one less closer arm available on the market as Huston Street and Jeremy Jeffress figure to get more of a look. New York Giants wideout Odell Beckham Jr. was forced out of practice Sunday with an apparent ankle/leg injury after having CB Janoris Jenkins land on him. Beckham limped off noticeably and soon headed for testing after trying to come back into practice. Analysis: Many drafted fantasy football teams with Beckham already on it are holding their breath. Like we saw last summer with Jordy Nelson and Kelvin Benjamin, one false step in practice could finish a player. In a shocking turn of events, Jonathan Lucroy has officially vetoed his trade to the Cleveland Indians. No word on why he decided to veto the move but Lucroy has that right in his contract with the Milwaukee Brewers. Analysis: Stunning. So much for Lucroy saying he wanted to go to a contender. The door is now open for the New York Mets and Texas Rangers to get back into this trade discussion. Stay tuned. The reliver market continues to dominate leading up to the Aug. 1 trade deadline as the St. Louis Cardinals got in on the action early Sunay by nabbing lefty setup man Zach Duke from the Chicago White Sox. Analysis: Good move by the Cards and Duke is the second prominent lefty reliver to go to a new team on Sunday following Andrew Miller to the Cleveland Indians. Will Smith should be up next. The New York Mets front office is growing increasingly worried about the health of slugging outfielder Yoenis Cespedes as he is sits out again on Sunday. Internally there is talk of a possible DL stint for Cespedes if the issue doesn't improve in the next day or two. Analysis: The Jay Bruce talks could accelerate after hearing this as the Mets are very depleted now with Jose Reyes, Lucas Duda, David Wright, and Juan Lagares on the DL and now they could be joined by Cespedes. Needing to shore up a depleted bullpen after trading away Aroldis Chapman and Andrew Miller, the New York Yankees picked up Tyler Clippard from the Arizona Diamondbacks. Clippard came up in the Yankee system as a starter before he was moved to the Washington Nationals organization. Analysis: Clippard is quickly becoming a journeyman as this is his fourth team going back to the beginning of 2015. Clippard will likely go into the eighth inning to setup new closer Dellin Betances. FANTASY BASEBALL TRADE DEADLINE BREAKING NEWS: YANKS LISTENING ON "EVERYONE"
The New York Yankees are listening on "everyone" according to a team source as the front office has decided that contention for a wild card spot is not realistic and a reboot for 2017 is now fully underway. The Yankees have already moved closers Aroldis Chapman and Andrew Miller for a big package of prospects and now in turn are listening on Carlos Beltran, Brett Gardener, Jacoby Ellsbury, C.C. Sabbathia, and Ivan Nova. Analysis: McCann and Beltran have the most chance of being moved, with the former requiring the Yanks to pick up some salary. Beltran seemed like a good fit for Cleveland but the Indians only went with Miller in Sunday's deal. Another day and another trade involving a closer as the New York Yankees sent away lefty stopper Andrew Miller to the Cleveland Indians for a prospect package that includes outfielder Clint Frazier, pitcher Justus Sheffield, and others. Miller takes his sparkling 1.33 ERA, 0.77 WHIP, and insane 77 strikeouts in 45.1 innings to the ninth inning in Cleveland and he leaps over incumbent closer there in Cody Allen. Allen has had some ugly stretches of bad performances over the last two years (particularly early in 2015 and 2016) but he has been very good this season with a 2.58 ERA and 1.08 WHIP while striking out 57 batters in 45.1 innings. Still Miller is the better and much more consistent arm and he retains the big value boost he got a week ago when Aroldis Chapman was sent to the Chicago Cubs by the Yankees. Meanwhile Allen is now nothing but a setup man who has little to not value depending on if your league has holds as a category. Also the Yankees are ready to deal away whoever can get them some more prospects so get set for some more deals. Arizona Diamondbacks manager Chip Hale has endorsed Jake Barrett as his new closer in place of the struggling Tyler Clippard. Barrett has pitched to a glowing 2.79 ERA and 1.22 WHIP this season for the D-Backs and he has collected 39 strikeouts in 38.2 innings. While he did give up a home run in his save chance Saturday night, Barrett successfully finished it off the game. Analysis: Third closer already this season for the D-Backs as they dealt Brad Ziegler and Clippard was plain bad. Barrett should be added in all formats as teh volatiity really gets crazy among closers with Aroldis Chapman, Mark Melancon, and now Andrew Miller all being dealt. Wade Miley: 7 IP 1 H 1 ER 1 BB 9 K with an ERA of 4.98. Minor push toward respectability for Miley who has been an abomination. If you can register even a somewhat competent ERA while calling Safeco Field home, you are nothing to me. Jake Arrieta: 7 IP 4 H 2 ER 3 BB 4 K with an ERA of 2.75. Very rarely do you lose when giving up four hits but Arrieta got screwed out of a win. What is interesting is that his K rate has dropped more than a bit over the last month and again we have to worry about all those inning he has tossed the last season-plus. Something to monitor the remainder of this season. Devon Travis: 2/4 with his 7th HR while hitting .298. It is almost like Travis doesn't exist anymore in the eyes of the fantasy baseball community because nobody talks about him. He was gone for awhile but he is hitting with force just like he did before his shoulder went bad early on last season. J.A. Happ: 7 IP 3 H 1 ER 3 BB 11 K with an ERA of 3.16. This is the story I have no explanation for. Not every day you see a career-year MOVING into the AL East and Rogers Center as your home base. David Dahl: 1/4 with his second HR while hitting .348. I am in love. Just watch Dahl go nuts the last two months of the season and become a third round pick next year. Or second round. Justin Verlander: 9 IP 5 H 2 ER 1 BB 11 K with an ERA of 3.54. Not vintage Verlander 2009 but we will take it and be happy considering how ugly 2014 and 2015. The zip on the fastball has returned somewhat this season which is pretty much all that has changed here for the better. Brad Miller: 2/4 with his 16th HR while hitting .253. Add Miller to the growing list of post-hype sleepers made good in their locale. Brett Gardner: 1/3 with his 7th HR while hitting .256. I have to say that Gardner is on the verge of being totally irrelevant now in fantasy baseball. You lose you speed which was his calling card and that is pretty much it when even the modest pop starts to fade away for good. Jason Kipnis: 2/3 with his 17th HR while hitting .288. Very nice season for Kipnis who is on pace for a high in home runs and still runs just enough to help across the board. Mike Napoli: 3/3 with his 23rd HR while hitting .246. Napoli has rejuvenated his career with the Indians and also somewhat in the fantasy baseball community. He has been a tremendous value asset in AL-only formats with the always potent power and even in mixers this is the type of guy you keep on the bench when you need a quick home run infusion on a sagging fantasy baseball lineup. Marcus Semien: 2/4 with his 22nd HR while hitting .233. Semien is pretty much the new Brian Dozier. Right? Josh Tomlin: 7 IP 6 H 2 ER 2 BB 7 K with an ERA of 3.43. Rare do we get a K/IP from Tomlin in any one start but we got it here. He remains a very nice SP 5 in all formats but in innings-capped leagues the lack of consistent K's is an issue. Mitch Moreland: 2/4 with his 17th HR while hitting .245. Walk-off shot from Moreland who is getting into a power groove. You know what to do there. Pick him up and insert until a few 0-for-4's crop up. Dee Gordon: 1/4 with his 7th SB while hitting .264. Gordon is back which means a ton of steals and runs atop the Miami lineup. What will be key now is to see how much of an average hit he takes presumably being off the steroids. Remember that the batting title Gordon won a year ago was so far in outlier territory that you couldn't see it. Chemically enhanced? Until he proves otherwise then yes. Marcell Ozuna: 1/4 with his 19th HR while hitting .298. Another home run for Ozuna who is on a recent binge like Mitch Moreland. Unlike Moreland, Ozuna has been a steady source of average, RBI, and home runs all season as the new power but lacking speed four-category OF 2. Hernan Perez: 3/4 with his 7th HR while hitting .283. Like in Philadelphia, Milwaukee has yielded some tremendous hitting value plays in 2016 fantasy baseball. You have Jonathan Villar becoming a top tier fantasy baseball shortstop overnight and now Perez doing his thing at a deep third base. Remember next season that bad teams yield the best valeus. Gregory Polanco: 1/4 with his 14th HR while hitting .287. Like Starling Marte before him, Polanco has solved some early holes in his swing to become a terrific hitter and as a result, has seen his power launch. Cameron Rupp: 3/5 while hitting .273. Rupp has not gotten a lot of type on him in this space but I did say in this season's draft guide he was looking like a good value play in two-backstop formats. A .273 average is always nice for a catcher. Jean Segura: 2/4 with his 9th HR while hitting .312. We are almost into August now and Segura is still over .300 with his average. Tremendous comeback campaign by the guy but we still have to see it for six months which was the problem earlier in his career. Joc Pederson: 1/4 with his 15th HR while hitting .239. Very few signs of improvement from Pederson as the Dodgers are forced to hit him at the bottom of the lineup. The holes in the swing are still gaping and the power is predictably down now too because opposing pitchers don't have to throw him anything in the zone. Braden Shipley: 6 IP 5 H 0 ER 1 BB 4 K with an ERA of 0.00. Nice debut for sure as Shipley had no nerves by the looks of it. This is a pedigree pitcher who was a solid prospect for awhile. The K rate is medicore though for a top young arm so don't go thinking Shipley is going to be a monster pitcher the rest of the way. The Cleveland Indians acquired New York Yankees closer Andrew Miller as reported by Fox SPorts' Ken Rosenthal. Miller joins Milwaukee Brewers catcher Jonathan Lucroy as two huge gets for the Indians leading up to the Monday Aug. 1 deadline. Analysis: Dellin Betances welcome to the ninth inning. It is now crystal clear that the Yankees are tearing it down as Miller goes just days after Aroldis Chapman. Carlos Beltran, Brett Gardner, and Ivan Nova could join them now. As far as the Indians are concerned, this is a huge deal to go with Lucroy as it signals they are ready to stake their claim to the World Series. Miller should supplant Cody Allen in the ninth inning, although it is not a given. Meanwhile Betances instantly becomes a top five fantasy baseball closer with his insane K rate and impossible to hit stuff. Matt Kemp: Going into Saturday's action, Kemp was having a nice season with 23 home runs, 69 RBI, and a .262 average. With zero stolen bases on the season, the 31-year-old Kemp is showing he is no longer anywhere near the five-category first round star he was just a few seasons ago. Rampant and serious shoulder and leg injuries have robbed Kemp of almost all his speed but his power is still playing very well. 23 home runs while calling Petco Park home is a very impressive tally and Kemp actually gets a slight ballpark improvement going to Atlanta. While the park there still favors the pitcher, Kemp will benefit a bit going there. The bigger picture also entails how Kemp will be part of the rebuild in Atlanta and serve as very good and much-needed protection in the lineup for Freddie Freeman. Freeman has been on an island all his own the last two seasons and that has really hurt his RBI and run totals and also allowed pitchers to pitch around him. That will be less of an issue with Kemp in town. Considering the power, Kemp is still holding his OF 3 tag. Hector Olivera: The same age as Kemp at 31, the troubled Olivera gets a fresh start in San Diego after being suspended by MLB 82 games for being involved in a domestic fight with his significant other. Getting close to a return as the suspension gets set to finish, Olivera will now get a clear chance to show what he can do as an everyday player in San Diego. There is still open debate as to how good or even moderate a player Olivera can be but at least he will get a shot. He should not be added in anything but deep leagues. Whether it was posturing earlier in the day or not, the New York Mets and Cincinnati Reds are again discussing a deal involving outfielder Jay Bruce. A team source said the talks were pretty much finished earlier in the day but got started again when the Mets failed to move on their discussions with the Milwaukee Brewers regarding Jonathan Lucroy. Brandon Nimmo has been mentioned as a piece that could be going back to the Res but the Mets won't deal prized infield prospect Ahmed Rosario. Analysis: On and on it goes. The Mets are desperate for a bat as they are last in baseball in hitting with RISP and Bruce can help make up for the loss of Juan Lagares and the shaky play of Michael Conforto. The Cleveland Indians reportesly have jumped into the lead on Milwaukee Brewers catcher Jonathan Lucroy and also included in talks is lefty setup man Will Smith. Lucroy and the New York Mets were connected earlier in the day but talks between those two sides cooled when the Brewers asked for Michael Conforto. Meanwhile Smith would be the lefty reliever the Indians have been searching for all season to go with Lucroy being a big upgrade behind the dish. Analysis: This sounds like it has major traction and now the only question is what the Indians will have to give back. The Brewers have said all along they want a top prospect back for Lucroy so stay tuned. Tony Watson will get first crack at the closer gig in Pittsburgh which was vacated earlier in the day when the team traded All-Star stopper Mark Melancon to the Washington Nationals. Watson is a lefty but his excellent tenure with the team and current 2.48 ERA puts him in play first over Neftali Feliz. Analysis: We went back and forth on this but it appears Watson is the guy. He is a tremendous pitcher and is a big difference-making player the rest of the way if you can get him. So much for being sellers. The Kansas City Royals pulled a surprise on Saturday when they acquired speedy outfielder Billy Burns from the Oakland A's. Burns was bought low by the Royals as they pick him up during a season where the leadoff man got demoted to Triple-A after hitting just .234 with 14 steals. Analysis: Interesting move by the Royals who have an eye on rehabilitating Burns and it is a worthwhile gamble for sure. We saw last season that an optimal Burns can score runs, steal bases, and bat for a respectable average. Whether pitchers adjusted to him or not, Burns struggled badly in 2016. The move might not mean the Royals still won't move closer Wade Davis or others. FANTASY BASEBALL TRADE DEADLINE FALLOUT: MARK MELANCON KICKS JONATHAN PAPELBON TO CURB, NEFTALI FELIZ LIKELY TO STEP UP IN PITT. The Washington Nationals made a resounding move to combat their chief NL rivals the Chicago Cubs after the latter acquired All-Star closer Aroldis Chapman to shore up their main weakness going into the stretch run of the season. With their own closer Jonathan Papelbon melting down horrible over the last few weeks, the Nats were desperate for a solution themselves and they got one early Saturday in the form of Pittsburgh Pirates All-Star Mark Melancon. Melancon will come over to Washington now to close games in place of Papelbon, with the latter having lost almost all of his fantasy baseball value in the process. Meanwhile Melancon remains one of the very best closers in the game as he totes a splendid 1.51 ERA and having nailed down 30 saves. Melancon's value doesn't change much and that is of a top five closer no matter how you look at it. Meanwhile in terms of the gaping hole now in the ninth inning in Pittsburgh, there are two candidates that include lefty Tony Watson and righty Neftali Feliz. The real key here is that Feliz has the experience edge and he closed out successfully a game last Monday in place of a resting Melancon. Feliz has been an abomination the last couple of seasons as he made his way back from elbow surgery but he has thrown well in 2016 with a 2.97 ERA and there is life back on his fastball with 45 whiffs in 39.1 innings. Watson has been tremendous himself with a 2.66 ERA and has been a lockdown guy for his six seasons with the team. If we had one spot to use, we would use it on Watson as he has gotten chances in the past when Melancon was injured but there is a case for both. The Washington Nationals finally filled their giant void at closer Saturday by agreeing to a deal with the Pittsburgh Pirates for All-Star stopper Mark Melancon. Melancon was scheduled to be a free agent at the end of the season and he will now step in for the struggling Jonathan Papelbon. Analysis: Great move by the Nats as they finally get someone very capable to be a lock down closer. This was a perfect answer to the Cubs getting Aroldis Chapman as the two clubs go at it for NL supremacy. Papelbon meanwhile can be cut in all formats. With NFL training camps opening up this week, the big news item on Wednesday was the New York Jets re-signing quarterback Ryan Fitzpatrick to a one-year deal worth $12 million. Those who already drafted Jet skills position players, in particular wideouts Brandon Marshall and Eric Decker rejoiced with Fitzpatrick's return. After all it was a scary proposition thinking of Geno Smith being under center in Week 1 and failing to consistently get the football to his playmakers. So with Fitz back in the fold, let's take a closer look at Marshall and where he fits for 2016 fantasy football. Amazing number for Marshall who showed that he is still very much a WR 1 in fantasy football and with Fitzpatrick back, it right in that category for 2016 as well. While the Jets still love to run the football, there is no denying the amazing chemistry between Marshall and Fitzpatrick and they should have no problems hooking up again at a high rate this season. Marshall is one of the best PPR receivers in fantasy football today but he also is a big red-zone weapon as well. That means he is a WR 1 both in PPR and in standard and another run at 100 catches is likely. Durability is also part of the equation for Marshall which makes him that much more of a big asset this season. While a bit of regression in yardage might be in the cards, Marshall should go no latter than the end of Round 2 in drafts this drafting season. FANTASY BASEBALL BREAKING TRADE DEADLINE NEWS: SOURCE SAYS METS AND JAY BRUCE "NOT HAPPENING"
A team source connected to the New York Mets front office said that talks between the team and Cincinnati Reds over outfielder Jay Bruce "are pretty much dead" and that a trade is simply "not happening" right now. The Reds want Ahmed Rosario for Bruce which the Mets quickly rejected and it appears the team has something more concrete in the works with the Los Angeles Dodgers. Analysis: We had it first with the Nimo-D'Arnaud report Friday and this is the same source we used for that now accurate post. Bruce and the Mets don't match up right now unless a third team gets involved. Updating a report we posted Friday that was a full 24 hours before it was repeated again Saturday, the New York Mets offered Brandon Nimmo, Travis D'Arnaud, and a third player believed to be Wilmer Flores for catcher Jonathan Lucroy. The Brewers rejected that offer and came back with Michael Conforto and D'Arnaud for Lucroy which the Mets also kicked back. Analysis: It seems like there is something to work with here and maybe the Mets do Conforto-D'Arnaud for Lucroy and let's say Will Smith or Jeremy Jeffress. This has legs to it from what we are being told. Jason Heyward: 2/4 with his 5th HR while hitting .229. Heyward's contract already looks like one of the worst of all time. And I said from the beginning he was incredibly overrated in fantasy baseball. Its like the guy forgot how to hit when he was reaching his prime. Red flags. Jon Lester: 6 IP 4 H 0 ER 2 BB 7 K with an ERA of 2.95. Lester is particularly tough at home with an ERA under 2.00 in the friendly confines. Chris Carter: 1/4 with his 23rd HR while hitting .217. Next stop: .200. Junior Guerra: 8.2 IP 4 H 1 ER 1 BB 5 K with an ERA of 2.70. Please. A year ago a minor league medicore arm by the name of Taylor Jungmann did what Guerra is doing now. Then he got absolutely destroyed the next season and was back on the farm. Guerra has only 85 strikeouts in 103.1 innings and so there is a ton of trouble when he is not getting the extreme BABIP luck he has received. You have been warned. Max Scherzer: 7 IP 5 H 1 ER 2 BB 6 K with an ERA of 2.85. Once the home run rate began to steady, Scherzer was right back to the slam dunk fantasy baseball ace he always has been. Shawn Kelly: scoreless .1 IP for sixth save with an ERA of 3.05. Kelly is the man now in the ninth inning for better or for worse as Papelbon officially looks like toast. Xander Bogaerts: 2/5 with his 13th HR while hitting .331. If Bogaerts keep this up, he will back up right into the wall of a fantasy baseball first round draft. Jackie Bradley Jr.: 1/4 with his 17th HR while hitting .298. The development of Bradley has been a solid surprise. Not that I didn't think he had talent but instead there were legit concerns about the contact rate and ability to bat for average. Answered in the affirmative. Rick Porcello: 9 IP 5 H 2 ER 0 BB 3 K with an ERA of 3.47. Listen Porcello has talent and was a former early round pick for a reason but his margin for error is razor thin in any one start due to his soft fastball. That is deadly in the AL as we have seen so I would still avoid at all costs despite the tidy ERA. Rougned Odor: 3/4 with 2 home runs (21 for season) while hitting .282. Now up to 21 homers and 10 steals to go with an average that is inching toward .300. In two years it is staggering to think how incredible Odor could be. Special talents like this don't come around often. Whatever you pay for him next season will be worth every penny. Jurickson Profar: 2/3 with his 5th HR while hitting .301. Hearing the Rangers could move Profar but that is kind of ridiculous to me. Injuries or no injuries, the kid remains a major prospect. They waited all this time for him to come back and now are ready to unload him after two months of very good hitting? Doesn't make sense. Eric Hosmer: 1/4 with his 14th HR while hitting .282. Hosmer will finish with 19-20 home runs like usual. Dependability is underrated in evaluating a fantasy baseball hitter. Sure we expected some more from Hosmer but the bottom line is still quite impressive. Adam Eaton: 1/4 with his 8th HR while hitting .272. Eaton falls into that category of fantasy baseball player that no one wants anymore after he let many down as a failed sleeper initially. This despite the fact Eaton has developed into a very useful commodity as an OF 3. It is situations like this where you can turn a major profit on a player and ultimately win your league. Jeremy Hazelbaker: 1/2 with his 8th HR while hitting .248. Remember when everyone picked up Hazelbaker after he got hot the first two weeks of the season? Well not me as it was a clear case of "new season/100 percent attention in fantasy baseball community" at work there. Hazelbaker was a fluke as I said then and needless to say he did a nice job proving that out. Marcell Ozuna: 2/4 with his 18th HR while hitting .299. Ozuna is a bit under the radar in Miami because no one wants hitters from that ballpark not named Giancarlo Stanton. Terrific power though which plays nicely in today's game. Keep him on your value lists for 2017. Carlos Gonzalez: 2/5 with his 21st HR while hitting .317. Gonzalez is well behind last year's home run pace which is no shock here since that was in clear outlier territory. Remember that when a veteran guy goes nuts and above his career norms by a large margin one season, it almost always means a correction the following year. Tyler Collins: 2/4 with his third HR while hitting .204. Good game but Collins is not long for the majors with J.D. Martinez on his way back. Failed to impress. Justin Upton: 2/4 with his 12th HR while hitting .236. This falls into the too little, too late bin. Upton still has two months to at least make something right but he has shown no signs of doing so. Jose Altuve: 1/4 with his 18th HR while hitting .356. Unbelievable. You can now make the case with the power uptick that Altuve is the single most dominant fantasy baseball hitter in the game. Edwin Encarnacion: 2/3 with his 28th HR while hitting .265. We did a head-to-head between Paul Goldschmidt and Jose Abreu in March. Maybe it should have been Goldschmidt-Encarnacion. Jayson Stark is reporting that a three-team deal that would involve Cincinnati Reds outfielder Jay Bruce going to the Los Angeles Dodgers is in the works. There was no word on who the other team is but Bruce to the Dodgers is being heard on multiple spots. Analysis: The Dodgers are never ones to sit idly by at the trade deadline but they need pitching more than hitting with Clayton Kershaw injured. Maybe they also get a pitcher with Bruce as well. Stay tuned. Having already made closer David Robertson and starter James Shields widely available, the Chicago White Sox now reportedly are willing to listen to offers on slugger Todd Frazier. Straddling near the .200 mark all season but with big power, the White Sox are trying to do a quick rebuild for 2017. Analysis: Not a shock as Frazier has been good but not the impact guy the White Sox thought they were getting. He would bring back a big package but unlike with Roberston and Shields, the Sox don't seem in a rush to move him. Updating an earlier item, the Cincinnati Reds are asking for rehabbing New York Mets pitcher Zack Wheeler for outfielder Jay Bruce. Analysis: Bruce is the second bat the Mets have been connected to the last few days in addition to Milwaukee Brewers backstop Jonathan Lucroy. Not sure if the Mets would deal Wheeler considering how many pitching injuries they have but they clearly are in search of a bat. Following our own Michael Wong's exclusive report almost a week ago where he reported the Washington Nationals front office would say as much, Jon Morosi has echoed that the team is willing to move top pitching prospect Lucas Giolito for New York Yankees closer Andrew Miller. The Nats are desperate to get help in the ninth inning after the recent meltdown of Jonathan Papelbon and have been connected to Miller, David Robertson, and Mark Melancon. Analysis: Wong nailed it from the start and the Yankees have to jump all over that deal if offered. Giolito is considered can't miss and closers are always overpriced this time of year. The trade deadline activity is really getting going, with the latest deal being the San Diego Padres sending pitchers Andrew Cashner and Colin Rea to the Miami Marlins for injured reliever Carter Capps and Tayon Guerrero. Lets check out the fantasy baseball ramifications shall we? Andrew Cashner, Colin Rea: The Marlins really needed arms to complement ace Jose Fernandez in order to help them hold onto a wild card berth which they presently own. They get two relatively young arms in Rea and Cashner, and the latter has had some fantasy baseball pop at times the last few seasons due to his hard fastball that was capable of eliciting strikeouts. Alas Cashner has never really panned out as his current 4.76 ERA attests and that is even more scary a number considering half of his games come at spacious Petco Park. The bottom line with Cashner is the fact that rampant arm and shoulder injuries have robbed him of his past high-octane stuff and at 29, his current 7.60 K/9 rate is very average. The fact that Cashner was only barely an SP 5 in San Diego means he retains that very limited value with the Marlins who have the same type of spacious ballpark. As far as Rea is concerned, he has been hammered this season to the tune of a 4.98 ERA and a very ugly 6.89 K/9 rate. A 3.99 BB/9 rate also shows that no only does Rea hurt himself with free passes but he can't miss bats either. He should not be owned in any fantasy baseball league. Carter Capps: The real gem in the deal for San Diego is the fireballing Capps who picked up instant fame in his debut a year ago with his full hop with his left leg before he delivers his 100-mph heat. Capps was unhittable last season as he put up a 1.16 ERA and registered an insane 16.84 K/9 rate. You just don't see K rates like that and while Capps is recovering from Tommy John surgery (no shock given the hard-throwing nature), the Padres finally have a closer for the future after going through a ton of mediocre to bad options there the last few seasons. According to a team source connected to the Washington Nationals front office, the team made a "strong pitch" to the Chicago White for their closer David Robertson. With the Nationals having seen Jonathan Papelbon epically melt down over the last three weeks and not wanting to go into the postseason with Shawn Kelly as the closer, Robertson has been targeted as the main solution to their ninth inning problems. Analysis: With Andrew Miller unavailable and the price way too high for Wade Davis, Robertson seems to be the guy the Nats will go strong after. It makes sense as Robertson is a very good closer, his struggles this season notwithstanding. According to the Miami Herald, the Miami Marlins also acquired SP Colin Rea with Andrew Cashner. Rea has pitched to a 4.98 ERA so far this season for the San Diego Padres and will likely man a back end spot in the Marlins' rotation. Analysis: Decent haul for the Marlins who certainly filled some holes in the rotation but both guys have ERA's well over 4.00 with Petco as their home base. No moves needs to be made with either Cashner or Rea however in fantasy baseball terms. Hernan Perez: 2/4 with his 6th HR and 2 SB (16 for season) while hitting .279. Once again I remind you that some swell fantasy baseball values can be had on bad teams. Just like the pitching and Odubel Herrera coming out of Philly, Perez has been some value as a 6/16 power/speed diamond in the rough. While his overall hitting skills are still up for debate as pitchers continue to adjust to him, the juice is quite valuable for a middle infielder. Zach Davies: 6.1 IP 6 H 2 ER 1 BB 5 K with an ERA of 3.59. Those in Milwaukee who miss Kyle Lohse have a younger clone now in town. David Price: 8 IP 7 H 0 ER 1 BB 6 K with an ERA of 4.26. I think Price is primed for a monster finish as beneath the ugly ERA, he continues to rock a double-digit and career-high K/9 rate and his BABIP has been unlucky throughout. Brad Ziegler: blown save with 2 unearned runs in .1 IP for an ERA of 2.56. The short tenure of Ziegler as the closer in Boston is pretty much finished as Craig Kimbrel is set to get back at the end of the weeked. Mitch Moreland: 2/3 with 2 home runs (16 for season) while hitting .237. Moreland's power is not in question but honestly he has pretty much proven himself to be another Justin Smoak which says it all about how much of an ordinary fantasy baseball he is. Rougned Odor: 1/3 with his 19th HR while hitting .277. Next season Odor has the talent to be an early second round pick. If you get him in the third round you did very well. What a talent. Cole Hamels: 8 IP 6 H 2 ER 1 BB 12 K with an ERA of 2.84. Full transparancy: I had Hamels down as a bust candidate this season moving from the NL and into the AL in one of the worst parks in the game. Needless to say I blew that one and Hamels has been insanely good which is doubly impressive in that park. Aroldis Chapman: 1.1 scoreless inning for his first save with the Cubs. Best and most impactful move of the trade deadline so far. What will the Nats do in response? Aaron Altherr: 3/4 with his first HR while hitting .750. See Perez, Hernan. Another potential diamond in the rough here as Altherr is an Odubel Herrera type in that he has power and can really run. Remember that he hit 5 homers and stole 6 bags in a cup of coffee debut with the team a year ago. Pick him up everywhere. Tommy Joseph: 2/5 with his 14th HR while hitting .262. The average is headed for .250 as it should given the K Rate but geez Joseph is hitting home runs at a rate that is far beyond what he did in the minors. Again take it as a grain of salt but "ride it out." Been a longer ride than anticipated. Maikel Franco: 1/5 with his 19th HR while hitting .259. Some have asked me if I am disappointed in Franco after he was one of my strongest sleeper touts this season. I mean the guy has 19 home runs with two months to go. I am fine. Adam Jones: 2/4 with his 19th HR while hitting .269. What is funny here is that for all the narrative that Jones is moving past his prime, he is not far from .280 and 30 home runs which is where he has been the last four or five seasons. Let it play out. Max Kepler: 2/3 with his 11th HR while hitting .243. This has been some debut so far for Kepler who is hitting for big power even in Target Field. What is crazy is that Kepler hit only 9 home runs in the minors a year ago and 1 this season there before his promotion. That calls into question the legitimacy of the power as this is not Adam Duvall 2.0. Jacob DeGrom: 7 IP 5 H 0 ER 1 BB 6 K with an ERA of 2.56. Coming off his worst outing as a pro, DeGrom dominated. That means the complete game he tossed prior to the Miami mess was likely the sole reason for his bomb the last time out prior to this. All is well. Jeurys Familia: second straight blown save with 2 ER in .1 IP with an ERA of 3.14. Familia was not even supposed to pitch in this one and was on fumes. Fatigue an issue and it was down the stretch a year ago so this needs to be watched. Aledmys Diaz: 2/5 with his 14th HR while hitting .313. Diaz' spectacular debut continues unabated and honestly I thought this would ebb long ago. Stamp of approval. The Miami Marlins have acquired SP Andrew Cashner from the San Diego Padres to bolster a rotation that is top-heavy with ace Jose Fernandez. The return package is not known yet but Cashner takes a high 4.76 ERA East. Analysis: Surprising as the Marlins really have a completely barren farm system but apparently something clicked here. Cashner was once a decent sleeper due to his impressive fastball but he has been shelled and injury-wracked for awhile now. No move needs to be made. The San Francisco Giants acquired Minnesota Twins outfielder Eduardo Nunez late Thursday for a minor league arm. Nunez was in the midst of a major breakout season with the Twins this season and he will help shore up an inconsistent Giants lineup. Analysis:. Great add by the Giants as Nunez has put it all together as a five tool stud this season. They still need bullpen help which will likely be their main focus now. -The biggest news of the day is that Pittsburgh Steelers running back Le'Veon Bell is a virtual lock to get suspended four games for missing multiple drug tests by the league. This of course is the second time Bell has run afoul of the substance abuse policy in the NFL and that is why there is almost zero chance he will get any games shaved off the suspension. As a result, Bell should be knocked down a few rounds due to the missed games but by the third round he shapes up as a very good value play as there is no debating he is the very best running/receiving back in the game. That also meane veteran DeAngelo Williams is a must add for all Bell owners and he should a year ago that hs still has plenty of tread on his tires. -Seattle Seahawks tight end Jimmy Graham began camp on the PUP list which was no shock given the gruesome knee injury he suffered a year ago. The Seahawks expect Graham to be ready for Week 1 but we saw a year ago that even when he was in the lineup, the former New Orleans Saints star was a major bust. We are not going back to this well. -Speaking of the Seahawks, running back Tomas Rawls is unlikely to be ready to go for the start of camp workouts but he might need to go on PUP as he is close. Rawls is also expected to be ready for Week 1 and remember that he was a revelation as a power running rookie a year ago before suffering a serious ankle injury. There is boom or bust potential here though as Rawls is far from a proven commodity and the very intriguing rookie C.J. Prosise from Notre Dame at the very least will be the pass receiving back and maybe more. In fact Prosise is one of our favorite running back sleepers of 2016. -Arian Foster is fully expected to be the starter for the Miami Dolphins as he checked into camp 100 percent healthy from last year's torn Achilles. We already heard rumblings that Foster would be the primary pass receiving back for the Dolphins which makes him a big PPR weapon but now with running back duties, he could be a swell RB 2 investment. -The Atlanta Falcons already were determined to feed second-year back Tevin Coleman in the running game but now they are ready to include him as a pass receiver as well. That was almost fully the domain of Devonta Freeman a year ago but Coleman was an adept reveiver in college. The fact that Coleman is now encroaching both in the running game and receiving game on Freeman puts the latter in clear bust territory as we already discussed earlier. So far it has been the trade deadline of the closer. With the Boston Red Sox picking up Brad Ziegler, the Miami Marlins Fernando Rodney, and the Cubs in their blockbuster get in acquiring Aroldis Chapman, the closers have dominated the trade conversation. There doesn't seem to be any letup there as now the Chicago White Sox' David Robertson has become the new name available out there as the Cubs' cross-town rivals have officially waived the white flag. Already the usual suspects in the Cleveland Indians, Washington Nationals, and San Francisco Giants are all connected to Robertson, with the Nats and Indians particularly aggressive. It is no secret the Indians are pining for lefthanded bullpen help but Robertson would be a sizable help either way. Now Robertson is in the midst of his worst MLB season with an ERA over 4.00 but he is still an impact arm who will be a big addition to either of those three teams which are involved. -Meanwhile the New York Mets are becoming agressive with Milwaukee Brewers catcher Jonathan Lucroy, especially with the team starting to fade from playoff contention. With the Mets depserate for a bat, Lucroy is about as good an option there as one can get. The price is big though for Lucroy and the Mets don't seem interested in moving a prime prospect piece like Ahmed Rosario. Also the Mets were connected to Arizona Diamondbacks reliever Daniel Hudson but no such move is imminent or even in the works. Hudson's ERA has soared past 6.00 so he is not a big impact either way no matter where he goes. -Wade Davis is the other closer who is a major hot commodity and the Los Angeles Dodgers are heavily involved with this one. As we reported earlier, the Royals are trying to move Ian Kennedy and the four more years left on his contract with Davis and the Dodgers are debating it. Without Kennedy, the Royals will then want a major piece like Julio Urias. The Kansas City Royals have internally decided to become sellers leading up to the Aug. 1 trade deadline, in particular looking to take advantage of a major seller's market when it comes to top closers. The Royals have one of those closers in the ultra-dominant Wade Davis and reports surfaced Thursday that the Los Angeles Dodgers are hot on his trail. The Royals want to dump Ian Kennedy and the remaining four years left on his deal in any deal with Davis though which at the very least is holding up talks a bit. Analysis: Davis is becoming more and more likely a guy who will be dealt and other than Aroldis Chapman, migjht be the most domiant closer in fantasy baseball. Kennedy was a colossol mistake in free agency as the Royals stupidly gave a five-year deal to the medicore veteran but getting anyone to take that much money left on his deal could be tough. FANTASY BASEBALL BREAKING TRADE DEADLINE NEWS: RANGERS FRONT-RUNNERS FOR LUCROY? A report has surfaced Thursday indicating that the Texas Rangers are possibly the front-runners in the Jonathan Lucroy sweepstakes. There was buzz early Thursday that Lucroy was about to be traded after he was not in the lineup for that day's matinee game but later it was explained he was simply getting a routine day off. In addition to the Rangers, the Boston Red Sox are reportedly strong contenders for Lucroy. Analysis: It apepars as though something is imminent in terms of Lucroy being dealt and honestly the Brewers have no reason to hold onto him as they would clearly be selling high. Stay tuned. Giancarlo Stanton: 2/5 with his 22nd HR while hitting .245. Stanton has been destroying the baseball for the last month or so and honestly he pretty much is back where he should be numbers-wise across the board after that brutal April. Considering the ugly average, in hindsight Stanton should be a second rounder in 2017 and not going in the first. Adam Conley: 6.2 IP 8 H 0 ER 3 BB 6 K with an ERA of 3.38. Conley has been a nice value play as an SP 5 this season. He doesn't do any one thing great but the overall package has beeen quite useful. Stephen Strasburg: 7 IP 3 H 0 ER 2 BB 7 K with an ERA of 2.68. Strasburg picked up his 14th win and now should be considered one of the prime favorites for the NL Cy Young. I have long maintained here that I was never one to own Strasburg due to the cost and combined injury risk but never have I questioned his ace talent. Blake Treinen: scoreless .2 IP for his first save with an ERA of 2.01. Felipe Rivera was given the chance in the ninth but quickly gave up a run and was pulled for Treinen. This is one big mess right now but I guess Treinen is the guy to own. Daniel Murphy: 2/4 with his 20th HR while hitting .351. The gall of Murphy to go 0-for-5 the previous night. You are forgiven Dan as he now reaches the 20 home run mark for the first time in his career. Alex Dickerson: 1/4 with his sixth HR while hitting .286. Fourth straight game with a home run from Dickerson and right now he is the most valuable Dickerson in fantasy baseball. With Melvin Upton now in Toronto, this Dickerson should be given everyday playing time and at on power alone, is worth an add. Remember that seasons in 2016 have started like this for guys like Adam Duvall and looks where that has gone. Miguel Cabrera: 3/4 with his 21st HR while hitting .301. Knock Cabrera all you want for no longer hitting .330 with a pace of 40 home runs. Clearly a victim of his past immense success, Cabrera is still raking more than enough and 30 home runs will be a tremendous total no matter who it came from. Dustin Pedroia: 1/4 with his 11th HR while hitting .303. Pedroia has been red hot and is actually having a very fine season with his customary .300 average and decent enough pop. A striped down version without the steals no doubt but Pedroia has shown he is not done as a regular contributor in fantasy baseball just yet. Xander Bogaerts: 1/4 with his 11th HR while hitting .331. Mr. Bogaerts I would like to apologize for some mean words I typed here about you in the past. Now that you can hit home runs and run to go with the batting title average, you win. Madison Bumgarner: 8 IP 5 H 1 ER 0 BB 9 K with an ERA of 2.09. Those who have been readers from the begining know I saw greatneess in Bumgarner right from the start. It took others a bit to catch one which is why I owned him for a few years at a deent price but not now and not again for a long awhile. It is amazing that just when you think we have seen the best out of the guy, he continually improves. Dan Straily: 7.2 IP 3 H 1 ER 1 BB 5 K with an ERA of 3.84. ERA is now under 4.00 as Straily continues to pitch well. The guy has obvious talent and put up some big K numbers in the minors but never has been able to stick with any on team. Jay Bruce: 1/4 with his 25th HR while hitting .271. I think the Blue Jays are going regret not making the deal for Bruce and instead going with Melvin Upton Jr.
Andrew McCutchen: 3/5 with his 15th HR while hitting .246. The average has never come around and even the power will not go near the 30 mark and may never again. While McCutchen has at leats been respectable, it is comical to look back and see that these numbers cost a first round pick. Gerrit Cole: 9 IP 3 H 1 ER 0 BB 6 K with an ERA of 2.78. Cole has been dominant his last few starts and it shows just how good he can be if he can stay healthy which has been his biggest callenge. The K's are down quite a bit though as he admittedly has pitched more to contact. While we can overlook that to an extent, the health has to cooperate and it never totally does for a full season which makes Cole one of the riskiest fantasy baseball aces in the game. Kris Bryant: 1/3 with his 26th HR while hitting .283. Those who drafted Bryant in the third round a year go when we knew he would begin the season in the minors......this was why. Bryant is having an MVP season both in real and in fantasy baseball and 50 home runs seems to be in the future as soon as 2017. What a talent. Javier Baez: 1/4 with his 11th HR while hitting .287. Baez hitting .287 is like anyone else hitting .347. Kudos to the kid as he really cut down on the whiffs which threatened to make him a Quad-A guy. The Cubs are playing it right with Baez too in batting him near the bottom of the order to take pressure off of him. Its working and the future is bright again. Addison Russell: 1/4 with his 12th HR while hitting .248. Russell lacks the flash that Baez has in that he doesn't run and unlike Baez, he remains an average liability. Jason Hammel: 7 IP 5 H 1 ER 2 BB 7 K with an ERA of 3.23. Wow it is almost August and Hammel is still throwing well. As surprising as the fact that Lyle Lovette once married Julia Roberts. Alas August usually is the line of demarcation with Hammel so the narrative has not changed just yet. David Dahl: 1/4 with his first HR while hitting .250. Love this kid. Here is what I could see happening though. Dahl is very capable of going 10/10/.315 the rest of the way and all of a sudden he becomes a second round pick next season. Jon Gray: 7 IP 5 H 1 ER 2 BB 3 K with an ERA of 3.94. On the road, on the road, on the road. Manny Machado: 1/4 with his 21st HR while hitting .311. Yeah the steals seem to have dried up already but Machado doesn't hold anyone's jock and his first round price tag this past March has been justified after many said it wouldn't. Masahiro Tanaka: 5 IP 7 H 4 ER 2 BB 4 K with an ERA of 3.16. Yes you guess it. This one came on four days rest where Tanaka's ERA is over 4.00. On five days rest it is under 3.00. Rinse and repeat. Lance McCullers: 6 IP 5 H 1 ER 2 BB 10 K with an ERA of 3.18. McCullers is quickly becoming one of the best strikeouts artists in the game right before our eyes and yes I will say this: his path looks very similar so far to Clayton Kershaw with early injuries, poor control, and massive strikeout stuff. Yasmany Tomas: 2/5 with 2 home runs (17 for season) while hitting .262. While there have been scores of recent massive Cuban hitting busts (Alex Guerrero, Rusney Castillo, Yasiel Puig), this guy has delivered. After some fits and starts, Tomas has gone right along the scouting report in terms of power and an average average. Freddie Freeman: 4/4 with his 18th HR while hitting .280. Kudos to Freeman who has had a nice season despite the lack of any help in the Braves lineup. Depending on what the Braves front office does in the offseason in terms of protection, Freeman's stock will go north. Updating an earlier item, the New York Jets and Ryan Fitzpatrick came to an agreement on a one-year deal worth $12 million. Analysis: Same writeup applies about the fortunes of Fitzpatrick, Decker, and Marshall as the previous post. With the New York Jets having opened up training camp Wednesday, talks are progressing between the team and free agent QB Ryan Fitzpatrick. The Jets have gotten destroyed in the local media over the last few weeks as camp neared and that seems to have pushed the organization to move close to what Fitzpatrick wants out of a deal. Analysis: A deal could be agreed upon by the end of the night is what we are hearing. This is great news for the fantasy value of wideouts Eric Decker and in particular Brandon Marshall and Fitzpatrick himself will be a top QB 2 in two passer formats. Stay tuned. It was no secret that the Texas Rangers were among the most aggressive teams in baseball looking to shore up their rotation heading into the stretch run of the season. They were connected pretty much to every available name out there, most recently to Andrew Cashner and Chris Archer. The didn't land either of those two on Wednesday but instead got some help in the form of the Atlanta Braves' Lucas Harrell. Harrell heads to Texas with reliever Dario Alvarez for infielder Travis Demeritte. While Harrell has been pretty much the definition of a journeyman, he is coming off his most dominant outing of the season Tuesday when he tossed six shutout innings against the Minnesota Twins. With a 3.38 ERA and 1.29 WHIP, this pretty much is as good as it gets for Harrell who has a career ERA of 4.74. Harrell is quite hittable which is why he has not made a home for long at any one MLB locale he has gone through and in Texas in their bandbox of a park, things could get ugly quick. Not the move the Rangers needed to help a rotation destroyed by injuries and Harrell should not be added in any formats. -The Washington Nationals are in crisis mode now for bullpen help after seeing closer Jonathan Papelbon melt down again Tuesday. Papelbon is showing his age and looks like a guy who is begging to be replaced in the ninth which Dusty Baker hinted at. Nats have obsessed over Andrew Miller but Yanks are hot streak and unless they are blown away (think Lucas Giolito which the Nats are now mulling over), the lefty will stay. Also the market for Carlos Beltran has not developed as anticipated so he likely stays as well. Meanwhile Ivan Nova looks like a classic fallback for those who miss out on Rich Hill, Andrew Cashner, and more prominently Chris Archer. Meanwhile as far as the Nats are concerned and the bullpen, Ryan Madson is now off their list as he too has struggled badly lately. I am hearing Jeremy Jeffress and Will Smith as the main targets now for Washington and the talks could heat up quickly. Seeing what the Yanks got for Aroldis Chopman though, the Brewers likely want to drive up the price on those two. -The San Francisco Giants are looking for pitching and they have been connected with both Cashner and Hill. Cashner seems to be a name that is being fought over by the Giants, Texas Rangers, and to a lesser extent the Miami Marlins. -Speaking of the Marlins, they are calling about every available pitcher but are not getting anywhere due to their awful farm system. -The Mets are not getting Joathan Lucroy for Travis D'Arnaud and they seems resigned to not being a player there. -The Los Angeles Dodgers seem like they are on the fence regarding Chris Sale as they know it will start with Julio Urias and go on to other young names that have to be included. They also have been connected to Archer for awhile but nothing has developed past the initial stage. Kansas City Chiefs rehabbing running back Jamaal Charles opened up training camp on the PUP list as he continued to work his way back from a torn ACL in his knee at the start of last season. The Chiefs plan to take it slow with Charles and instead feature Charcandrick West and Spencer Ware to see who should be the primary backup. Analysis: Charles should be ready to go in Week 1 but there are a few issues here. One big one is that Charles has now had two ACL tears, with one in each knee. The second is his age as he is 29 which is getting up there. The third is that the very capable tandem of West and Ware will likely take a decent amount of carries from Charles this season. Add it all up and Charles is quite risky near the top of the running back rankings. 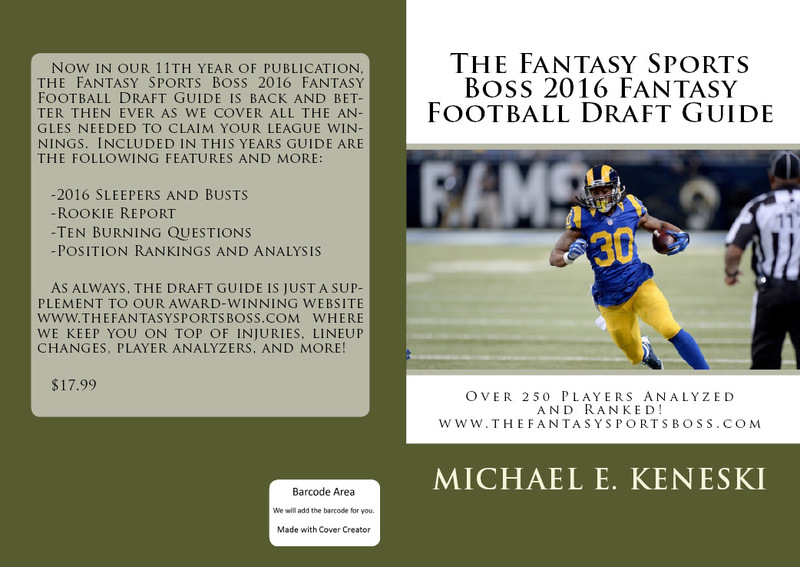 If you still haven't gotten your copy of the 2016 Fantasy Sports Boss Fantasy Football Draft Guide, what are you waiting for? Use the BUY NOW tab below to pick up your copy for $17.99. 1. Antonio Brown: Other then maybe Odell Beckham Jr., there is Pittsburgh Steelers wideout Antonio Brown and everyone else. Extending his streak to three straight seasons with 100-plus receptions, Brown hauled in a ridiculous career-high 136 balls for 1,834 yards and 10 TD. All of this despite Ben Roethlisberger missing handful of games with injury and having to deal with the challenge of catching passes from Michael Vick and Landry Jones. The fact of the matter is that there is not a more dominant PPR receiver in all of fantasy football and Brown’s video-game numbers make him well worth the number 1 overall pick in those leagues. Even in standard formats, Brown’s double-digit scores and massive yardage make him a locked-in first round selection. If Roethlisberger stays healthy this season, the numbers could be insane. 2. Odell Beckham Jr.: While Antonio Brown holds down the top receiving spot at least for another season in these pages, one can make the argument that the New York Giants’ Odell Beckham Jr. is deserving of such consideration. After all through his first two NFL seasons, Beckham Jr. has lit up opposing secondaries with some of the most jaw-dropping catches ever. The numbers are staggering here as Beckham has caught 90-plus passes, gone over 1,300 yards, and scored a total of 25 touchdown his first two years in the league. Of course Beckham Jr. has to own it when it comes to costing his fantasy football owners in as bad a way as possible in getting suspended for the Week 16 championship game due to receiving three personal fouls in a massive confrontation with former Carolina Panthers and current Washington Redskins cornerback Josh Norman. That bout of immaturity aside, Beckham Jr. should be the no doubt number 2 wideout off the board around the midway point of Round 1. As long as Beckham Jr. can ward off his old hamstring troubles and keep his mind right, ace numbers will commence. 3. Julio Jones: While Antonio Brown and Odell Beckham Jr. get most of the headlines, Atlanta Falcons star wideout Julio Jones went about his business in 2015 by catching an extreme 136 passes for 1,871 yards and 8 touchdowns on a bad Atlanta Falcons team. Having now missed only one game over the last two years, Jones is also starting to quiet the injury prone label that dogged his first few years in the league. Firmly planted in his prime and remaining the number 1 target for QB Matt Ryan, Jones is the best PPR receiver out there outside of Brown. The one nitpicking knock you can have on Jones is that he has only reached double-digits in receiving touchdowns once in his career but other than that there is no reason he should not be going off the board at the end of Round 1. Evan Gattis: 1/3 with his 17th HR while hitting .221. Re-claiming catcher eligiblity has pretty much 80 percent of the value alone for Gattis as his .221 average is nasty to go with the big power. Andrew Miller: scoreless ninth for his 9th save with an ERA of 1.39. Instantly Miller becomes a top five closer in all of fantasy baseball with Aroldis Chapman out of town and maybe even the top guy overall. Compare Miller and Wade Davis over the last three seasons. See my point? Joey Votto: 2/3 with his 18th HR while hitting .279. Next stop: .300 average. Jay Bruce: 1/5 with his 24th HR while hitting .271. All Bruce owners were daydreaming what it would have been like seeing Bruce hitting bombs in Rogers Center. Instead they went out and got Melvin Upton Jr.
Adam Duvall: 2/4 with 2 home runs (25 for season) while hitting .247. Duvall was stone cold quiet coming out of the break, with some blame likely going to the Home Run Derby which tends to screw up swings for awhile. This is a great sign that Duvall is back, at least hitting bombs which is pretty much his only skill as the average has sank way back down as the 30 percent K rate has done its thing. Joey Gallo: 1/4 with his first HR while hitting .200. Gallo didn't waste any time picking up his first homer and there will be a bunch. Seems like the Wrapup today is littered with ugly average/home run specialists such as this kid. Gallo truly is a horrific contact guy, with some K rates that have sailed way above 30 percent which is unfathomable. Still Gallo can hit 30 homers in his sleep and also has some speed to pick up 10-15 steals. Coco Crisp: 2/4 with his 8th HR while hitting .237. First Torii Hunter and now Coco Crisp is headed for retirement as per the rumors. I can't take the emotional hits in my "favorites" wing. Josh Reddick: 2/4 with his 7th HR while hitting .296. Someone will come calling the next five days for Reddick as they should. At least with Crisp and Hunter retiring or retired, Reddick will still be around as I have come to love him and his 20-HR/10-SB/.275 body of work. Sonny Gray: 6 IP 5 H 3 ER 2 BB 8 K with an ERA of 5.43. Better but not saying much. My goodness Gray stinks this season and it is too late in the process likely for him to turn it around. 2016 needs to be completely thrown to the wolves and now we go to see if Gray can be salvaged as even an SP 3. What a fall. Scooter Gennett: 2/3 with his 6th SB while hitting .264. Gennett has actually been pretty decent and not in the running as one of the most boring second baseman in fantasy baseball. Still works best in NL-only formats where Gennett has had his best value ever. Tyler Skaggs: 7 IP 3 H 0 ER 1 BB 5 K with an ERA of 0.00. First MLB start for Skaggs since 2014 in coming back from Tommy John surgery and needless to say the kid looked great. Tremendous pedigree here as Skaggs prior to the surgery was considered a big prospect and the post-hype tag applies. Pick him up. Wilson Ramos: 2/4 with his 15th HR while hitting .339. Look at that average! Ramos is right there with David Ortiz in "didn't see that coming" in terms of the batting title average. Combined with his usually good power and Ramos is challenging Jonathan Lucroy and Buster Posey for the top spot among all fantasy baseball catchers this season. Took long enough but at least we are finally there. Anthony Rendon: 2/4 with his 12th HR while hitting .257. Rendon will never get back to his grossly inflated first round tag in 2015 but at least he is yielding numbers that are helpful. Drastically reduced expectations here. Jonathan Papelbon: third blown save with 2 ER in 0 IP with an ERA of 4.18. It is almost like Papelbon is telling the Nats to go and get Andrew Miller. After this latest mess, Dusty Baker hinted that a change could be in the offing. Not such great options behind Papelbon as Felipe Rivera has a 4.44 ERA and Oliver Perez 4.25. Could this spur the Nats to send Lucas Giolito to the Yanks for Papelbon? Jedd Gyorko: 1/4 with his 13th HR while hitting .257 in Game 1. St. Louis: the land of retread players who make good. Noah Syndegaard: 6 IP 7 H 2 ER 3 BB 8 K with an ERA of 2.45. Bad pitch efficiency here for Syndegaard but it was 96 with high humidity during the outing so I am good with looking past this and not focusing on the bone spur. Carlos Martinez: 5 IP 5 H 2 ER 4 BB 3 K with an ERA of 2.87. Martinez also struggled with the heat so all is good all around. Jedd Gyorko: 1/3 with his 15th HR while hitting .258 in Game 2. Second time this season Gyorko has gone yard in both games of a doubleheader. Now you know who to pick up if rain causes the Cards to playt two again. Bartolo Colon: 7 IP 3 H 1 ER 0 BB 8 K with an ERA of 3.35. This guy is amazing. Best rubber arm since David Wells. Same gut also. The Los Angeles Dodgers are weighing whether or not to make a big offer to the Chicago White Wox for ace SP Chris Sale. Internally the team has talked about including a package headlined by Julio Urias to possible get Sale to front the rotation in the absence of the injured Clayton Kershaw who could be facing back surgery. Analysis: This makes total sense as the Dodgers are really hurting in the rotation with Kershaw down and we are not hearing good things about his back. Meanwhile Sale is wearing out his welcome in Chicago and the team might be thinking about waving the white flag on the season. Stay tuned. Multiple outlets are reporting that a trade is imminent involving San Diego Padres veteran hurler Andrew Cashner. Despite toting an ugly 4.79 ERA and 1.41 WHIP, Cashner has garnered a bunch of interest due to his hard fastball and relatively young age. Analysis: We are hearing it is the Texas Rangers who are the ones that have made the best offer but the Blue Jays, and Marlins are also said to be involved. Cashner had some interesting promise a few seasons ago before injuries began to sap some of his stuff. FANTASY BASEBALL BREAKING NEWS: ROYALS CALL UP RAUL MONDESI JR. The Kansas City Royals called up Raul Mondesi Jr. from Triple-A on Tuesday after the infielder was hitting .304 with 9 home runs and 5 stolen bases after serving a PED suspension. Analysis: Pick up Mondesi everywhere because like his dad, he can hit for power and run. The PED stain is an issue but Mondesi clearly has skills. Having lost out on Aroldis Chapman, the increasingly desperate Washington Nationals are now openly debating whether to offer up top pitching prospect Lucas Giolito for New York Yankees closer Andrew Miller. With the market dictating that Miller will cost a bundle after the Yankees got three prospects and a veteran arm in Adam Warren for Chapman, the Nats now realize it will cost Giolito to get someone as accomplished as Miller. With Jonathan Papelbon struggling quite a bit lately, Miller would likely go right into the ninth inning for the Nationals upon completion of a trade. Despite public proclamations to the contrary, the New York Yankees and GM Brian Cashman will move new closer Andrew Miller if they get another monster package in return like they received in the Aroldis Chapman deal with the Chicago Cubs. The Washington Nationals and Cleveland Indians remain very interested in Miller after losing out on Chapman. Analysis: Makes perfect sense as Cashman did an unreal job in getting Gleybar Torres and two other moderate outfield prospects to go with veteran pitcher Adam Warren for the free-agent-to-be Chapman. Miller has two years remaining on his deal which actually makes him more valuable in a trade so the bidding could get insane. Such a move would then finally give the dominant Dellin Betances a shot at closing. As NFL training camps get set to get underway, we are starting to get medical reports on key players in fantasy football who are coming back from major injuries and surgeries. One such case is Green Bay Packers ace wideout Jordy Nelson who tore his ACL in his right knee last summer and thus was not able to suit up for one down of the 2015 season. All throughout the offseason though, reports were positive on Nelson as he and the team both said he would 100 percent for Week 1. As the Packers coaching staff got together on Tuesday though, it was revealed that Nelson had a "scare" with his LEFT knee. The knee scare is serious enough to keep Nelson from practicing at the start of camp and underscores the risk of investing in a player coming back from such a serious health issue. When he is 100 percent right, Nelson is a clear WR 1 in fantasy football who stands out even more in standard formats due to his knack for collecting touchdowns. However the name brand carries a ton of weight and associated with Aaron Rodgers has Nelson going as early as Round 2 in drafts already and that could be a dicey spot to invest in someone with injury question marks already. Proceed cautiously with Nelson as both he and Randall Cobb (who struggled terrible without Nelson on the other side a year ago) values hanging in the balance. Melvin Upton Jr.: At one time a very promising and productive outfielder during his early years in baseball with the Tampa Bay Rays, Upton was a guy who could smack 15-20 home runs and run like the wind as he put up 40-stolen base campaign. As great as the category juice was, Upton at the same time was a major batting average liability as he began to routinely put up averages at or below .240 which took shine off his power and speed game. Things got so bad that the Rays gave up on Upton and then things got even worse with the Atlanta Braves after he signed a free agent contract there. In 2013 Upton has one of the very worst seasons a hitter has ever had in the modern era as he somehow batted just .184 in 446 at-bats. Things were not much better in 2014 as Upton only got the average up to .208 as he was completely lost at the dish under K rates that approached or went over 30 percent. Alas Upton got a fresh chance with the Padres starting in 2015 when in an injury-marred campaign, hit .259 with 5 home runs and 9 steals to at least show some ability remained. Look at the power and speed? The 16 homers and 20 steals would be a terrific output for an entire SEASON for most guys and Upton still has more than two months to pad those numbers. Still young at 31, Upton has not lost his speed and his power is growing more pronounced as he ages which is typical. While the average remains ugly, at least Upton is not hitting .200 or even .220. A 28.3 percent K rate remains nasty but a .322 BABIP is helping keep the average from the gutter. The last issue here of course is Upton's move to a prime offensive park in Rogers Center which will only help his already impressive power. Consider that Upton hit 16 home runs while calling Petco Park home and now moving into the launching pad that is Rogers Center? This should do nothing but good things for Upton's numbers. Throw in better protection in the lineup and this is a great move for his value. All in all, Melvin Upton Jr. has been some story this season and the good times should continue in his new locale. Props to those who bought awfully low. In a shocking move, NFL commissioner Roger Goodell has decided to reinstate Cleveland Browns ace wideout Josh Gordon after he serves four more games of suspension to start the 2016 season. Gordon has been plagued by NFL suspensions stemming from substance abuse but at least for now it appears he is ready to put that all behind him. 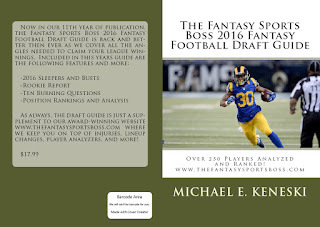 Of course now attention turns to 2016 fantasy football and what Gordon could do there at the still very young age of 25. One of the more supremely gifted rceeivers in the game when he is on the field, Gordon has the talent to be a fantasy football top tier wideout after he works off some rust initially. We have seen how dominant Gordon has been in the past with very poor QB play under center in Cleveland and now he returns to a team with a capable Robert Griffin III slinging him passes. While the risk of getting into trouble again remains high, Gordon could shape up as one of the very best value plays this season. Get him into your cheat sheets. Chapman/Hector Rondon: With a 2.01 ERA and insane 12.64 K/9 rate, Chapman is the best closer in fantasy baseball and has been for years. With a fastball that has touched a ridiculous 105 this season, Chapman will close for the Cubs over the very good Hector Rondon as well. Rondon has been very good going back to last season but it was apparent that Joe Maddon didn't totally trust him. As a result, Rondon loses prety much all of his fantasy baseball value as he moves into the eighth inning. Unless you have holds as a category in your league, Rondon is useless now. Feel free to cut him loose. Adam Warren: The Yankees loved Adam Warren when they owned him last season and were regretting it the moment they sent him to the Cubs prior to 2016. Warren fell flat on his face though to the tune of a 5.91 ERA and the Cubs were all to happy to send him back to NY. The Yankees have had rotation issues all season and could use Warren as a fifth starter, especially if Ivan Nova gets moved as expected. In AL-only leagues Warren can be picked up but this is as far as his impact will go. Gleyber Torres: Only 19, Torres is the main prospect piece in the deal who is still only playing in A-Ball. It will be until around 2018 when Torres will get a shot but he is being compared to a young Alfonso Soriano type so the upside is massive. Updating an earlier item, the Chicago Cubs and New York Yankees have agreed officially on a trade for closer Aroldis Chapman. The Yanks will send Chapman to Chicago in a monster return package that is highlighted by top infield prospect Gleyber Torres, outfield prospect Billy McKinney, and pitcher Adam Warren. Analysis: Wow did the Yankees get a huge package back from the Cubs. McKinney has stalled a bit in the minors but he has been considered a top outfield prospect for awhile, while Torres is widely considered to be a future star at either shortstop or second base. Meanwhile Warren could go into the rotation for Ivan Nova who will likely get dealt. Great deal for the Yanks as Andrew Miller moves into the closer spot. -Trade deadline week is always a prime circle the calendar part of the season where those in search of saves identify as a chance to pick up some additional numbers there. That is because trades of closers (usually on bad teams) that then become setup men in their new locales leave a vacumm in their old home where someone else steps up into the ninth inning and thus more saves can be picked up. Already we have seen Brad Ziegler get moves from the Arizona Diamondbacks to a setup role with the Boston Red Sox. Ziegler eventually moved into the ninth inning due to injuries Craig Kimbrel and Koji Uehara but his left behind an open spot in Arizona that was soon filled by veteran setup man Tyler Clippard. This week there are more than a few spots that could see closers moved, a grouping that includes Los Angeles Angels (Huston Street), Milwaukee Brewers (Jeremy Jeffress), Oakland A's (Ryan Madson), and most prominently Aroldis Chapman in New York with the Yankees. As far as fallout, Jonathan Papelbon and Hector Rondon owners are crossing their fingers that Chapman stays away beacuse the Cuban moves right into the closer role no matter where he goes. Even over a Hall of Fame-worthy arm like Papelbon. Looking at the other spots, Joe Smith would step in for Street (unless he too is moved), Sean Doolittle for Ryan Madson, and Will Smith for Jeffress. Doolittle and Smith could also be moved as well so this is volatile all over. We willl have all hands on deck Sunday into Monday all throughout the night and up to the deadline in order to get you the trades as they happen which means be sure to bookmark the site or follow us on Twitter (@RotoBoss) so you can strike as soon as the moves happen. According to the NY Post, the New York Yankees will get back their old setup man Adam Warren in a four player package for closer Aroldis Chapman. The Cubs and Yanks are close to announcing a deal that will be headlined by the Cubs sending top infield prospect Gleyber Torres to the Yankees in the deal. Analysis: This is a done deal as the Nats, Giants, and Indians have all moved onto other relief targets which is a sure sign he is headed to Chicago. Hector Rondon will move into a setup role which removes most of his fantasy baseball value, while Warren will slip into the 7th inning or maybe back into the Yankee rotation. Having lost out on New York Yankees closer Aroldis Chapman, the San Francisco Giants have turned their focus on adding a bullpen arm to include Ryan Madson, Jeremy Jeffress, and Huston Street. Analysis: Street is the latest name to be bandied about as he is having a horrible season with an ERA over 5.00 but is closing on a bad team which is always a bad match. Meanwhile the Brewers want to move both Jeffress and lefty setup man Will Smith, while Madson has been available for awhile but recent struggles have cooled his market. Santiago Casilla has done a decent job closing for the Giants this season but he is far from a given. With the Colorado Rockies dangling both outfielders Carlos Gonzalez and Charlie Blackmon leading up to the Aug. 1 trade deadline, some eyebrows were raised when they announced their promotion of top hitting prospect David Dahl to make his debut Monday. The sweet-swinging 22-year-old certainly has massive pedigree as a former first round pick (10th overall) in 2012 and he has been tearing it up at Double-A and then Triple-A this season. The fact that Dahl has moved into three different levels this season tells you how potent Dahl's bat has been and can be at the major league level. During that time, Dahl has shown five-tool monster ability as he hit .278 with 13 home runs and 16 stolen bases at Double-A before he moved to Triple-A and hit a crazy .484 with 5 home runs and 1 steal. Needless to say, Dahl can do it on on the field and looks like the next five-tool fantasy baseball outfield stud. Throw in the Coors Field locale for half his gams and Dahl has insane future and even present value right now who can be a major impact guy the rest of the way. We have seen already with Trevor Story and his MVP-like debut with the Rockies in 2016 how their prospects tend to come up and start mashing and Dahl should be able to do the same. This is a "run to the wire and add him" deal all the way.